I had heard much about The Hunger Games series, and had read the previous two books (& really enjoyed reading them), but unfortunately I didn’t enjoy reading Mockingjay as much. Katniss was such a strong, determined character in the previous two books, but in this one she struggles to cope with not only being manipulated by the Capitol but also by those organising the revolution. Although Katniss was my favourite character, I personally felt that she chose the wrong person at the end of Mockingjay. I was also quite sad to see that her fierce nature had faded near the end of the book. 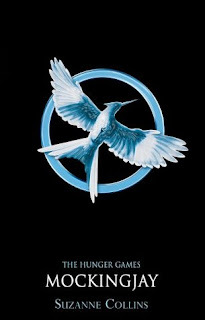 I liked the cover of Mockingjay, it represented Katniss’ last act of rebellion well, without giving too much away. I agree completely. I loved the first two books but just felt sad at the end of Mockingjay. After Katniss had gone through so much I desperately wanted more for her. I wanted an ending that made me shout "Yes!" The trilogy deserved it. I didn't feel like she really won in the end. And did her little sister really need to die to make the book work? Collins is an incredible writer. But after all that drama I needed a little more satisfaction.